Mwimba, M. and Dong, X. (2019). Quantification of the Humidity Effect on HR by Ion Leakage Assay. Bio-protocol 9(7): e3203. DOI: 10.21769/BioProtoc.3203. We describe a protocol to measure the contribution of humidity on cell death during the effector-triggered immunity (ETI), the plant immune response triggered by the recognition of pathogen effectors by plant resistance genes. This protocol quantifies tissue cell death by measuring ion leakage due to loss of membrane integrity during the hypersensitive response (HR), the ETI-associated cell death. The method is simple and short enough to handle many biological replicates, which improves the power of test of statistical significance. The protocol is easily applicable to other environmental cues, such as light and temperature, or treatment with chemicals. Environmental cues are important factors in determining the outcome of host-pathogen interactions. The disease triangle paradigm requires, among all, a favorable environment for disease to develop (Francl, 2001; Scholthof, 2007). High humidity, for example, represses HR development and negatively regulates ETI (Zhou et al., 2004; Xin et al., 2016; Mwimba et al., 2018). It is, thus, important to quantify the effect of environments on host-pathogen interactions. Cell death by HR during ETI is often quantified using a time-course measurement of ion leakage from infected tissue to the aqueous solution surrounding the tissues (Hatsugai and Katagiri, 2018). However, when interested in assessing the contribution of the environment to the HR development, it is necessary for tissue to remain in the environment being studied until HR has developed. In this protocol, we subject infected tissue to 50% RH or 90% RH for 36 h before conductivity is measured. Also, we have adjusted the dosage of the pathogen to OD600nm = 0.002 to delay the onset of HR and maximize the effect of the environment on HR development. The method adapted here was originally designed to measure cell death in senescing leaves (Woo et al., 2001). Leaves were immersed in 400 mM mannitol, and conductivity was expressed as percentage of the ratio of conductivity measurement before and after boiling. In this modified method, we use tissue of equal size (leaf disc), which make reporting percent ion leakage optional. This protocol was used in our study (Mwimba et al., 2018) and can be applied to other environmental cues or to chemical treatments. Grow 12 plants per genotype on soil for 3 weeks under 22 °C, 50% RH 12 h light/12 h dark condition. In a 15 ml tube, prepare Pst AvrRpt2 (OD600nm = 0.002) in 10 mM MgCl2 (or MgSO4). per plants with the Pst AvrRpt2. Note: It is much easier to infiltrate from the abaxial side of the leaf. Dry excess of Pst AvrRpt2 inoculum gently using Kimwipes. Move plants to chambers set to conditions being compared. Keep 6 plants per genotype under 50% RH 22 °C 12 h light/12 h dark and the other 6 plants per genotype 90% RH 22 °C 12 h light/12 h dark conditions for 36 h.
Note: We use Pst AvrRpt2 at OD600nm = 0.002 to capture the effect of the environment on the developing ETI. At this inoculant, the hypersensitive response becomes visible to the eye at around 24 hpi in plants under 50% RH. Collect dH2O in a 1 L beaker and confirm that the conductivity is below 1.5 µS/cm. Note: High dH2O conductivity generates high noise and can result in failure of the experiment. Using the EMS Rapid-core 6.0 puncher, collect 3 leaf discs per plant (1 disc per leaf) in a 50 ml tube (i.e., 6 tubes per genotype). Add 30 ml dH2O to each tube and rinse discs by inverting tube 3 times. Using dH2O, prepare 100 ml of 400 mM mannitol (7.3 g mannitol in 100 ml dH2O) per genotype. Note: Confirm ion measurement of the 400 mM mannitol is not greater than 3 µS/cm. For each tube containing leaf discs, replace all dH2O with 6 ml 400 mM mannitol. Shake tubes at 100 rpm for 2 h at room temperature. Using the Thermo Scientific Orion Star A322 electro-conductivity meter, measure initial ion leakage (see Figure 1) and proceed to data analysis. Note: When measuring, be careful not to hurt leaf discs or move discs across tubes during measurement. (Optional Step) If presenting data as percent ion leakage. For 10 min, boil samples by moving tubes to a water bath set at 100 °C. Measure total ion leakage and proceed to data analysis. Present data as corrected conductivity values or percent ratio of corrected initial to corrected total conductivity (see Figure 2). Corrected conductivity = Measured conductivity - Conductivity of blank. Figure 2. High humidity suppresses the hypersensitive response. A. Conductivity values measured 36 hpi and after boiling. Plants were moved to 50% RH or 90% RH after inoculation with Pst AvrRpt2 OD600nm = 0.002. B and C. Quantification of the hypersensitive response, described in (A), was graphed as membrane ion leakage measurement (B) and as percent membrane ion leakage (C). Data are mean ± S.D. Repeat the experiment at least three independent times for data reproducibility. For statistical analysis, use two-way ANOVA. The three experimental replicates can be combined using linear mixed-effect models. This work was supported by grants from the National Institutes of Health (NIH) (1R01-GM099839-01, 2R01-GM069594-09, and 5R35-GM118036) and by the Howard Hughes Medical Institute and Gordon and Betty Moore Foundation (GBMF3032). We have adapted this protocol from Woo et al. (2001). Francl, L. J. (2001). The disease triangel: a plant pathological paradigm revisited. The Plant Health Instructor. Doi: 10.1094/PHI-T-2001-0517-01. Hatsugai, N. and Katagiri, F. (2018). 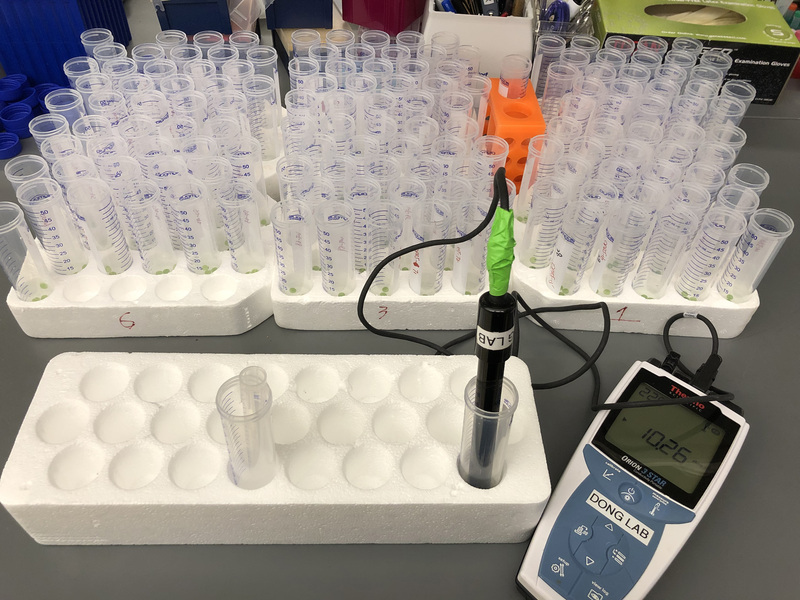 Quantification of plant cell death by electrolyte leakage assay. Bio-protocol 8(5): e2758. Mwimba, M., Karapetyan, S., Liu, L., Marques, J., McGinnis, E. M., Buchler, N. E. and Dong, X. (2018). Daily humidity oscillation regulates the circadian clock to influence plant physiology. Nat Commun 9(1): 4290. Scholthof, K. B. (2007). The disease triangle: pathogens, the environment and society. Nat Rev Microbiol 5(2): 152-156. Woo, H. R., Chung, K. M., Park, J. H., Oh, S. A., Ahn, T., Hong, S. H., Jang, S. K. and Nam, H. G. (2001). ORE9, an F-box protein that regulates leaf senescence in Arabidopsis. Plant Cell 13(8): 1779-1790. Xin, X. F., Nomura, K., Aung, K., Velasquez, A. C., Yao, J., Boutrot, F., Chang, J. H., Zipfel, C. and He, S. Y. (2016). Bacteria establish an aqueous living space in plants crucial for virulence. Nature 539(7630): 524-529. Zhou, F., Menke, F. L., Yoshioka, K., Moder, W., Shirano, Y. and Klessig, D. F. (2004). 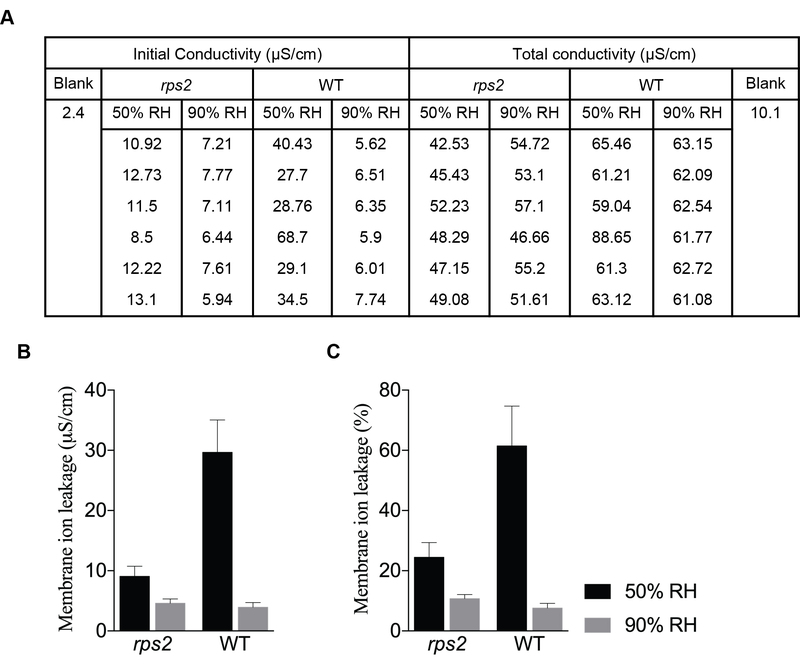 High humidity suppresses ssi4-mediated cell death and disease resistance upstream of MAP kinase activation, H2O2 production and defense gene expression. Plant J 39(6): 920-932. How to cite: Mwimba, M. and Dong, X. (2019). Quantification of the Humidity Effect on HR by Ion Leakage Assay. Bio-protocol 9(7): e3203. DOI: 10.21769/BioProtoc.3203.